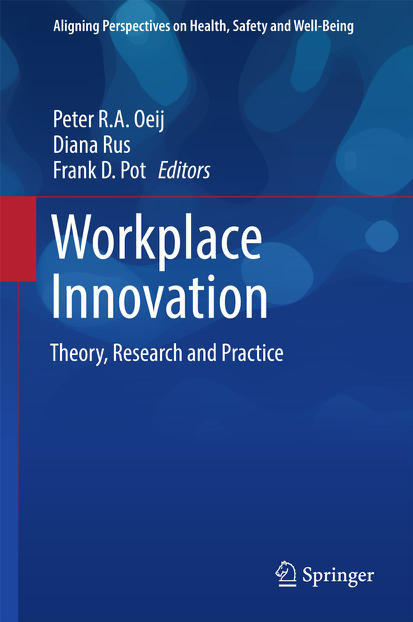 The recently published book “Workplace Innovation: Theory, Research and Practice” focuses on workplace innovation, which is a key element in ensuring that organisations and the people within them can adapt to and engage in healthy, sustainable change. It features a collection of multi-level, multi-disciplinary contributions that combine theory, research and practical perspectives. In addition, the book presents new perspectives from a number of nations on policies with novel theoretical approaches to workplace innovation, as well as international case studies on the subject. These cases highlight the role of leadership, the relation between workplace innovation and wellbeing, as well as the do’s and don’ts of workplace innovation implementation. Whether you are an experienced workplace practitioner, manager, a policy-maker, unionist, or a student of workplace innovation, this book contains a range of tips, tools and international case studies to help the reader understand and implement workplace innovation. The book includes contributions from SI-DRIVE partners “TU Dortmund University” (TUDO), “The Netherlands Organisation for applied scientific research” (TNO) and an Advisory Board member (Frank D. Pot).